Can Yoga Really Be Murder? Hi all! Once a month I’ll be blogging on Ink Spot–the blog for the writers of Midnight Ink–and cross posting here. This week, I’m blogging about my thoughts about combining yoga and murder in my writing. Check it out, and let me know what you think! There’s even a yoga philosophy lesson in there! 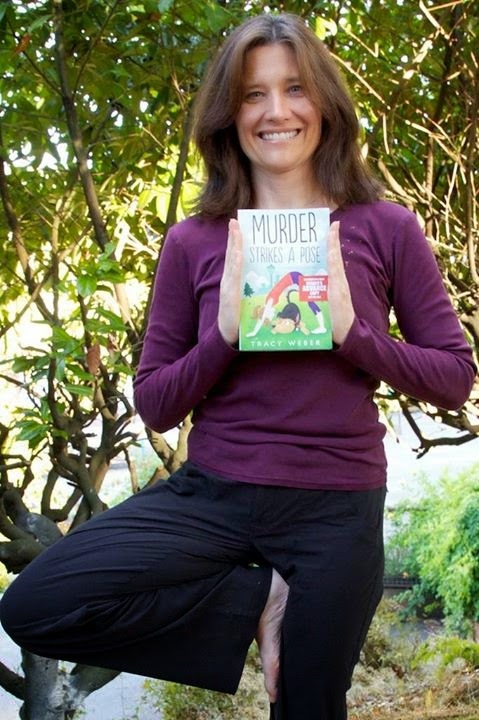 This entry was posted in Downward Dog Mysteries, Teaching Yoga, Viniyoga, writing, Yoga Books and tagged A Killer Retreat, blog tour, Cozy, cozy mysteries, cozy mystery, dog, dog mystery, Murder Strikes a Pose, Tracy Weber, yoga mystery, yoga philosophy on September 29, 2014 by Tracy Weber. I’ve spent the weekend answering press questions for the release of my next book, A Killer Retreat. Most of them were about writing, but one seemed particularly relevant to my yoga blog readers. Here’s the question and my answer. I hope you benefit from reading it. How can yoga be applied to people with imperfect bodies? Is yoga really about exercise or something else? Two thoughts came to me when I read these two questions: First, I’ve yet to come across a human being with a perfect body, either inside or outside of my yoga classes. Second, my favorite yoga quote is “If you can breathe, you can do yoga.” Yoga is ultimately the connection of body, breath and mind. Anyone can do it, and everyone can benefit from a well-designed yoga practice. I’ve taught yoga to professional ballet dancers, tri-athletes, and weekend warriors. I’ve certified yoga teachers who have multiple sclerosis, Parkinson’s disease, fibromyalgia and chronic fatigue syndrome. I’ve taught kids as young as six (others teach students who are even younger!) and adults who are ninety-years-old plus. I’ve taught students who were deaf, blind, and one who was both deaf and blind. I’ve taught group classes to students who use canes, walkers, and wheelchairs. I know of yogis who have no arms; others who have lost both legs. I have yet to find a student who couldn’t do some form of yoga, if it was appropriately modified. Yoga as a form of exercise is a Western idea. Its origins were more closely aligned with clarifying and balancing the mind. Physical fitness was simply a cool side benefit. We often confuse yoga in the West with asana (yoga postures), which is only one of many tools of yoga. Yoga encompasses that and so much more: meditation, pranayama, ritual, chant, right relationship, and so on. So yes, anyone and everyone can benefit from doing yoga. In Viniyoga, we adapt poses to the individual. The goal is to work within a pain-free range of motion with the goal of increasing that pain-free range of motion over time. My most rewarding work as a teacher is helping students learn how to move in a pain-free way, both during practice and out in their daily lives. Regardless of age, body type, injury, fitness level, or goals, yoga is a tool that that can help anyone. If you try a class and it doesn’t work for your body, try another! There are dozens of yoga styles, each different from the rest. There are at least a gazillion yoga teachers. I truly believe there is yoga for everyone. This entry was posted in Asana, Downward Dog Mysteries, Viniyoga, writing, Yoga Philosophy and tagged A Killer Retreat, asana, Cozy, cozy mysteries, cozy mystery, dog, dog mystery, downward dog mysteries, downward dog mystery, Tracy Weber, viniyoga, writing, yoga, yoga mystery on September 22, 2014 by Tracy Weber. This week’s blog entry was written by guest author Kristen Nelson. Kristen is a graduate of Whole Life Yoga’s 200 hour yoga teacher training program. She can be contacted at islandgabby@whidbey.com. Back in grad school, I read the book The Courage To Teach, by Parker J. Palmer. To quote from his book, “Good teaching cannot be reduced to technique; good teaching comes from the identity and integrity of the teacher.” I firmly believe, that being ourselves makes us better at teaching but can also play on our insecurities. You will never be able to serve all of your students, but if you’re like me, you’ll certainly torture yourself over why you can’t, or why they chose that other yoga studio, or class, or instructor. Let’s be honest, it’s not easy to get up in front of people, perfect strangers, find connection, while being authentic-just be yourself, right? It’s easier to be yourself though, when you’re prepared. Sure, we carve out adequate time for planning the perfect sequence, even though we know it doesn’t exist. We’ll make time to do the practice AND meditate before class begins. Yes, totally zoned out, prepared, with options for every kind of student-you know it’s a fantasy. The other insecurity, your students know way more than you. I had a student suggest I try more of a ‘dance style’ yoga, which is ‘so much fun’, or ‘hot yoga’ because ‘it really is a good work out.’ The whopper though, that cut to the depth of humiliation- my Yoga For Depression series. Guess what? NO ONE came. Yep. I don’t consider myself a depressed person, but after that, really? But let’s end on a positive note. A few years ago I created a yoga event for the winter solstice. The first year I had three people. I felt a small pang of regret, mainly because I had far exceeded my candle budget. The following year I had a friend visiting me and I was psyched because she was coming to the class. I joked she might be the only one there, but that might be awkward, so we made a backup plan-dinner. As my friend helped me light the thirty-some candles, people started to walk through the door and continued to fill the studio to MAXIMUM capacity. I tried to look cool, looking as if my classes are always brimming. But honestly, I wanted to cry, and not necessarily because people were showing up, but because I felt like my hard work had finally paid off. Hard work and a ton of heart behind the intention. My intention that night-to share and give. That’s it. See, you learn from experience. Don’t give up. And don’t let those insecurities get the best of you. Even if you have one student in your life , just one, you’ve made an impact. At the end of the day, those nerves, those insecurities, serve a purpose. If we get too comfortable, god forbid, too overly confident, we are not serving our students, because it’s about them, not about us. Sometimes we’re not sure why we teach, we just feel we need to, more than a want to-and that takes courage. This entry was posted in Guest Writers, Teacher Training Graduate Stories, Teaching Yoga on September 8, 2014 by Tracy Weber.